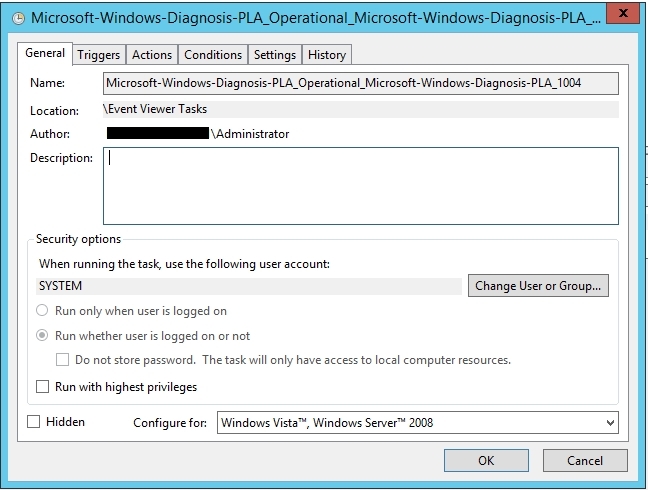 If you haven’t already got it open, open Event Viewer and navigate to Application and Services Logs\Microsoft\Windows\Diagnosis-PLA and select the Operational log. In the Start a Program option, enter Powershell.Exe for Program/script: and leave the other fields blank. We’ll fill those out later. Select the XML tab, and click on the Edit query manually checkbox. Select Yes on the warning message. Click Ok twice to get back to the properties window. All we need to do now, is configure the action to take when the alert triggers the task. #Transcript location can be configured as required. Write-Host "Failed to start SQLAudit"
If you find your collectors take longer than 30 seconds to stop, then update the value in the ‘For’ statement. Save this as a file on your server, and then configure the ‘Action’ in the Windows Task to call this script, by setting the Arguments and Start In details. I would highly recommend looking into having this script signed to prevent any security risks associated with storing scripts on the server. Note: Windows Server 2012 R2 was used when configuring this task. Other versions may be a little different. « Configuring Windows Task Scheduler to run daily Performance Monitor Data Collector Set.